Sara Perfin applied for counseling not long into her first year at Virginia Commonwealth University in Richmond, Virginia, hoping to finally find relief after years of dealing with severe depression. While her intake appointment at University Counseling Services (UCS) occurred not long thereafter, Perfin, like 35.9 percent of students at universities nationwide, according to the 2016 Association for University and College Counseling Center Directors (AUCCCD) Annual Survey, was placed on a waitlist. As she eventually learned that being on the waitlist meant that she might not even be seen by a counselor that semester, and as the pressures of being a freshman intensified, Perfin attempted suicide. A campus of 31,000 students in Richmond, Virginia, VCU suffers from an overabundance of students and an underabundance of student resources, a common problem on large college campuses. 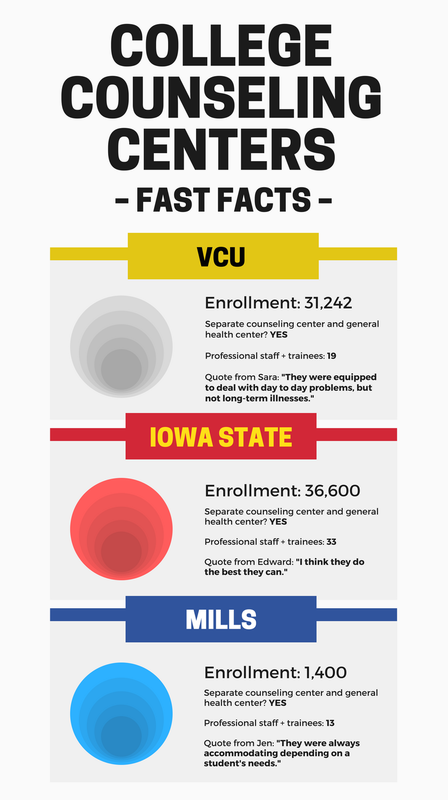 According to the American Psychological Association, the more students that attend a university, the more demand a university counseling center will experience. With more students than ever attending college, university counseling centers across the United States are having trouble keeping up with this demand. Failing to meet this demand means more students than ever are dealing with mental illness alone, without the chance of being helped. Among universities with between 30,000 and 35,000 students, like VCU, about 12 students per university were reported as being involuntarily hospitalized for psychological reasons, including suicidal ideation, otherwise known as suicidal thoughts. Perfin was one of these students, and she said UCS was the authority governing which students required these hospitalizations. Perfin’s experience is not uncommon. The AUCCCD survey says more than half of college counseling centers reported that student mental health concerns had increased over the 2015–16 academic year. Fifty-two percent of these students reported anxiety as their primary concern, while 41 percent reported depression as theirs. Edward*, a recent graduate of Iowa State University in Ames, Iowa, was dealing with newly-diagnosed depression when he first arrived on campus as a freshman. Iowa State enrolls more than 36,000 students, and, like Perfin, Edward faced the uncertainty of the waitlist when he first tried to sign up at Student Counseling Services (SCS). When Edward finally got in to see a counselor, he was disappointed with the care he received. While his singular experience does not necessarily speak to a larger problem among large college campuses, the sheer number of students seeking counseling — as evidenced by the waitlist — could mean the scope of care available is compromised. Luckily, Edward was able to take advantage of a service vastly more common at larger universities, according to the AUCCCD survey: group therapy. While students who attend group therapy sessions come from a wide variety of backgrounds, their mental health concerns are generally similar. At Iowa State, groups include grief counseling, men’s and women’s issues and one for students dealing with trauma. “I guess [group counseling] felt more authentic,” Edward said. He added he wished his individual sessions at Iowa State had been more successful, as the ease of scheduling at SCS did initially appeal to him. Eventually, he had to seek help from a therapist elsewhere in Ames. Not being able to attend to this growing need for individual mental health care means students like Perfin and Edward with serious needs are not only left unsure of their options moving forward, but might also watch as other students’ more minor concerns are prioritized. For Otis*, a graduate student at Iowa State, these kinds of “troubles” were exactly what he hoped counseling would be able to address at his previous university, which was around VCU’s size. After a breakup that left him miserable for longer than he felt was normal, he decided to stop by the counseling center for a session. As a teaching assistant, he realized this was a prime opportunity to take the advice he’d been taught to give others. At his appointment, Otis found a sympathetic counselor who let him tell his story, allowing him talk for as long as he needed without challenging his views. Most importantly, and unlike Otis’ friends, the counselor was willing to listen to his concerns without judgment. While smaller colleges are not immune to the issues suggested by the AUCCCD survey, Jen, an alum of Mills College in Oakland, California, feels their experience at the Counseling and Psychological Services (CAPS) Center was mainly positive. Mills, which enrolls 1,400 students, is unique in that it is an all-women’s college, but it is also deeply committed to accepting and affirming LGBTQ+ students, staff and faculty. They offer information for these students including on- and off-campus resources for specially-tailored health care, group therapy and safe, welcoming events. The kind of open communication that Mills provides in terms of LGBTQ+ health means mental health issues are also given a high priority. Even though Jen ended up needing mental health services beyond what Mills could offer, adding that they considered the limited number of sessions offered due to the college’s small size a drawback of their experience, they reiterated that Mills’ supportive atmosphere still helped them a great deal. Jen, like others who attend smaller colleges, benefited from the fact that counseling centers like CAPS serve a greater percentage of their student bodies, according to the AUCCCD survey. The atmosphere they describe is overall more welcoming and personal than the atmosphere at larger colleges. This overall lack of personable treatment leads to students like Perfin expressing frustration over the perceived shortcomings of VCU’s counseling center. But others, like Edward, are willing to give their school other chance, in spite of their personal shortcomings. “I think they do the best they can,” Edward said.